Jonathan Rea celebrates with his Kawasaki team plus wife Tatia and sons Jake (partially obscured) and Tyler. A record third successive World Superbike title is within touching distance for Jonathan Rea after the Kawasaki rider put more distance between himself and main rival Tom Sykes in Germany. 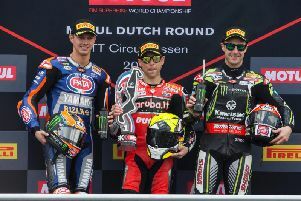 Rea twice finished as the runner-up at the Lausitzring, where Chaz Davies wrapped up a double on the Aruba.it Ducati. Yorkshireman Sykes claimed a rostrum finish in Saturday’s race in third behind Rea, but on Sunday the 2013 champion dropped more points as he crossed the line in fourth place. With only four rounds of the championship and eight races to go, Rea now holds a commanding lead of 70 points at the top over his Kawasaki team-mate as the Ulster rider remains firmly on track to make history. Rea is now a huge odds-on favourite to win his third World Superbike title in a row – a feat that has never been achieved in the championship. “I’m ecstatic after yesterday’s result; I didn’t expect to fight for the win but today after warm-up I really expected to be strong, but in the end I had nothing for Chaz – he was really strong so congratulations to him,” he said. “Even Marco was really strong so I had to give my 100 per-cent to stay in front of him. “The bike wasn’t comfortable to ride this weekend but as a team we made the most to make the best of it, but the problem with this track and all the bumps means my bike wasn’t behaving so nice, Rea added. “Instead of riding the bike and feeling at one I felt like I was wrestling the bike, so it was 21 hard laps and I rode with my heart and trying to bring it home. Rea appeared to be on course for his tenth victory of the season in race two after making a flying start and cutting through the pack on lap one. The reigning champion – who started from eighth place under the new grid rules for 2017 – reeled in Marco Melandri (Aruba.it Ducati) and made his move to take the lead on lap five. He began to open a slight advantage and as Davies struggled to find a way past team-mate Melandri, it seemed as though Rea would have an opportunity to make a decisive break. However, the Ulster rider was unable to put clear daylight between himself and the Ducati pair and once Davies eventually progressed to second place, he quickly closed the deficit to Rea before taking over the lead on lap 11. Rea was unable to respond and the 30-year-old had to maintain a high pace to keep Melandri at bay in third, with light spots of rain on the final laps necessitating the need for total focus to avoid any costly mistakes. Davies won comfortably at the end by 2.29 seconds, with Rea a further two seconds ahead of early leader Melandri. Sykes secured fourth after becoming embroiled in a battle with Alex Lowes (Pata Yamaha), Leon Camier (MV Agusta Reparto Corse) and Lorenzo Savadori on the Milwaukee Aprilia. Eugene Laverty (Milwaukee Aprilia) had been right in contention for the top six but a crash on lap eight ended his race. Portimao in Portugal hosts round ten of the championship from September 15-17.